DE Docent: 8/16/2009 - Hot! Hot! Hot! It looks like summer is finally here. It was pretty hot today. Surprisingly, it wasn't unbearable below decks. The heat did have an affect on the number of visitors. I had gave two tours, with a total of fourteen visitors. One advantage - with the small groups you're able to get everyone comfortably into all the compartments. During one of the tours I was asked about how long the USS Slater took to be constructed. In WWII terms it actually took the Slater a long while to be constructed (Approximately 11 months). 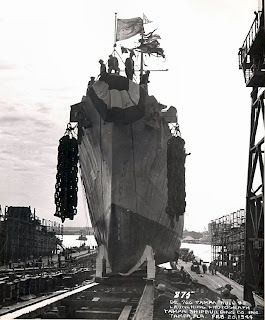 The keel was laid down at the Tampa Shipbuilding Company on March 9, 1943. The Slater was launched in February 13, 1944, and approximately three months later it was on Active duty. After 3 1/2 years of service the Slater was decommissioned. On March 1, 1950 the USS Slater was transferred to the Greek Navy. After 44 years of Service it became a museum ship. The ship history is available at Navsource.org.